We recently wrote about the history of the Ball Hockey World Championships, which began in Bratislava, Slovakia, in 1996. From those beginnings, the World Championships have grown to include World Championships for the Junior Divisions, held on the even years since 2000. Also, the Women’s and Master’s Divisions, held along with the Men’s Division, vie for their titles on the odd year since 2001. Most recently, the beautiful city of Prague, Czech Republic played host to the World Championship for Juniors. 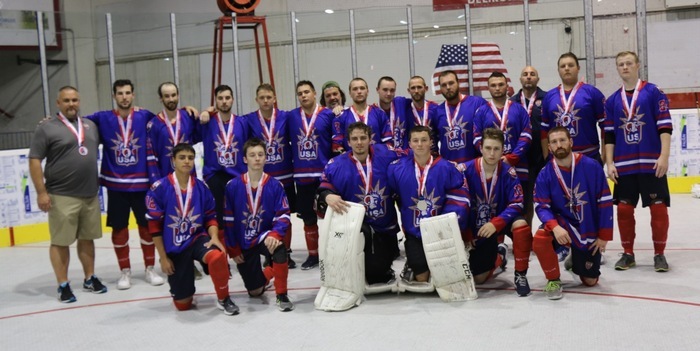 The US DekHockey Federation sent two teams to the World Championships. A third team planned to go, but due to the cost of travel to Europe, the final decision focused on two divisions. With players ranging in age from 18 years to 20 years of age, the U20 (20 and under) Division went. This highly competitive, five-team competition consisted of teams from Canada, Slovakia, Czech Republic, Hungary, and the USA. The U20 team included players led by Head Coach, Ken Bergeron. The second US DekHockey division consisted of participation in the U16 (16 and under) Division, led by Head Coach Joe Russo. Sending a strong contingent, the United States competed with teams from three other countries, Canada, Slovakia, and the Czech Republic. The two USA Teams excelled by bringing home Silver Medals. In both divisions, Canada won Gold, following hotly contested final games. In the U20 Division, the score stood at 5-0. Canada squeaked by the USA with a score of 3-1 in the U16 Division. The Physical results from the World Junior Ball Hockey Championships didn’t culminate in Gold. However, in every facet of play, the teams exhibited the goals and ideals of the US DekHockey Federation in “playing for the love of the game.” The competition fought hard for the goal. Consequently, well-deserved congratulations go out to all involved for their contribution to the DekHockey game we love to play.